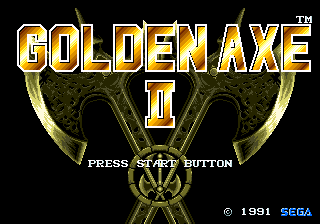 Golden Axe II (ゴールデンアックスII) is a 1991 beat-em-up and the direct sequel to the critically acclaimed Golden Axe. Unlike that game, Golden Axe II is a Sega Mega Drive exclusive, though it has since been re-released as part of numerous Mega Drive compilations. The game features Ax-Battler, Tyris-Flare, and Gilius Thunderhead once again, as they face the new foe "Dark Guld". It is extremely similar to the previous game, with various changes. For this reason, Golden Axe II has received mixed reviews from critics; many claim the game is merely a re-hash of the previous entry in the series, and that very little is added to the core gameplay. Though some have praised the graphics and music, others have criticised the game's sound effects which are said to detract from the atmosphere of the game. is used for attacking and for jumping, just like in the prequel. Pushing + together is now used to perform an all-around-attack rather than a backwards focused attack. Double tapping a direction makes the character run, pushing while running results in a charge attack. is used to cast magic. This consumes magic books (replacing potions from the prequel) which have to be collected first. Magic books are dropped by wizards. The strength of the magic attack is determined by the time the button is held down, but this can be changed in the options screen. Various game balance related changes have been made. Enemies could be trapped in endless charge attacks loops in the prequel. This is not possible anymore as two consecutive charge attacks trigger a short invincibility window. The previously exploitable jumping attacks have also been tone down in strength, certain enemy types such as lizardmen and claw wielding enemies can also effectively defend against these attacks. When playing on the lowest difficulty setting, the game ends prematurely. The final boss can only be faced when playing on normal or above. The highest difficulty setting adds new enemies to increase challenge. At the end of the game, score and a rank is awarded based on the number of enemies defeated and lives lost. The Duel mode from the original Golden Axe makes a return. Predetermined enemies have to be defeated in an arena. This game behaves strangely when played with the Six Button Control Pad: Movements are mapped to , , and . Holding down while the game is starting removes this problem. Strangely enough, emulators don't seem to have such problem. The game's sprites were drawn using a touchpad drawing tablet. The tablet used positional sensor technology developed by Sega. The same technology was used as a controller interface for the earlier 1987 arcade game World Derby and the later Sega Pico console. On the Mega Drive, Golden Axe II was followed by Golden Axe III. Sonic the Comic included few "The Legend of Golden Axe" comic strips the plot of which take place after Golden Axe II, the first story arc dealing with Dark Guld ressurection. The story arcs are: "Citadel of Dead Souls" (issue #1 to issue #6) and "Plague of Serpents" (#13 to #18). Emulated versions of the game were released for the Wii Virtual Console, Steam and iOS. The iOS version was removed from sale on iTunes in 2015. Main article: Golden Axe II/Changelog. Main article: Golden Axe II/Magazine articles.